Global house prices have been growing at 2.7% in the second quarter of this year compared with 4% last year, in inflation-adjusted terms, according to an index developed by the forecasting and quantitative analysis experts at Oxford Economics. The index is still slightly above the long-term average since 1997, but the slowdown is quite significant. When considered in conjunction with other international headwinds such as US President Donald Trump’s trade war, it becomes clear that the house prices slowdown could pose a serious threat to the global economy. In many markets, house prices have grown at breakneck speed since the financial crisis, spurred on by low interest rates and money-printing by the major central banks. The purchases of traditionally safe assets such as bonds by central banks have pushed investors into riskier assets. Some of them invested in equities, but many investors still consider real estate to be the safest bet there is, so they piled into the housing markets, particularly in Sweden, the UK, Australia, New Zealand and Canada. Now those markets are so over-heated that they could endanger global financial stability. While the index still shows relatively healthy growth, “beneath the surface there are several warning signs,” says Adam Slater, lead economist at Oxford Economics. House prices are still below their pre-financial crisis peak in many of the countries in the Organisation for Economic Cooperation and Development (OECD), made up by developed economies. However, they are 7% above their long-term average, similar to valuations during earlier cyclical peaks in 1974, 1979 and 1990. Valuations peaked at 12% above their long-term average before the financial crisis for 2007-2009. Currently, valuations are very different across countries. In a group of medium-size economies they are very high, at between 40% and 90% above their long-term average. These are Australia, Belgium, Canada, New Zealand, Norway and Sweden. 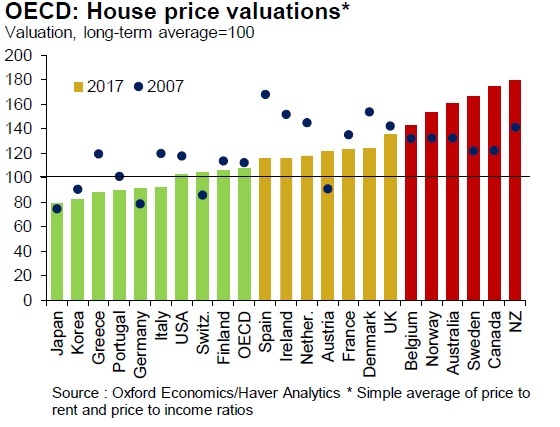 Currently, house prices in these countries are either stagnant or falling, with Sweden seeing a 7% decline in house prices. There have been numerous warnings that Sweden, where house prices had been rising without pause since the mid-1990s, was experiencing a bubble in its housing market. The exception to this is New Zealand, where residential property prices were still rising strongly. Home price valuations in the UK also look high, and this is hampering future growth. “It is likely that high valuations plus tighter monetary conditions have played a key role in the sharp slowdown in price growth in the UK, Australia, Canada and Sweden in the last year,” says Slater. If the global slowdown accelerates and a no-deal Brexit becomes reality, the safety of investing in houses, especially in Britain, will be tested.